Premium ultra thin HDMI cable designed for light weight and limited space applications. This ribbon cable is reinforced with a dual layer for extra protection. Right angle Micro HDMI Male adapter for small footprint in brushless gimbal applications and limited space applications. 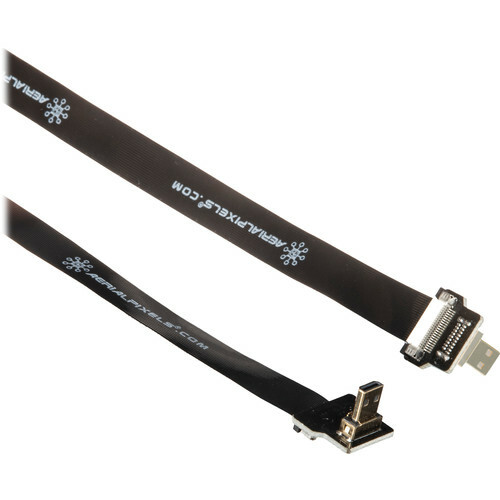 The flexible ribbon cable ensures minimum strain on gimbal (camera stabilizer) operation. Gold plated premium HDMI connectors. Optimized for high quality video and audio, excellent for connecting camera HDMI output to HDMI to anaglog video converters and Wireless HDMI Transmitters such as Paralinx, DJI Lightbirdge, Teradek, etc,. The ultra thin ribbon cable design uniquely separates this cable from rest in the market. Box Dimensions (LxWxH) 5.4 x 3.9 x 1.0"
Will this work with the Sony A6500? Unfortunately, there have been no reported tests for this particular application. It is our opinion, however, that it should work. If not, there is B&amp;H's 30 day return policy.